As I’ve been digging through the wonderful nuggets of data in the 7th Annual Match Singles in America Study, one that sticks out and makes me wonder why, is the debate between iPhone users versus Android owners. When CBS Radio asked me to weigh in on the subject on KNX – IN DEPTH, we had a lively discussion (Transcript at the end of this post). Here’s the question about the big digital elephant in the room. Are singles with iPhones really judging their dates if they carry an Android phone or have a cracked screen? Apparently so. 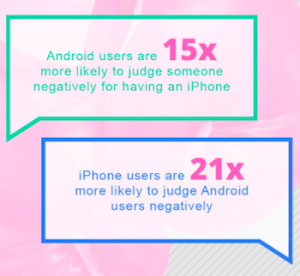 Android users are 15 times more likely to negatively judge an iPhone use. Let’s take it a step forward as your date card will be empty if you don’t upgrade or fix that cracked phone. The survey said that iPhone users are critical of other iPhone users if their phone is an older model, to the tune of 56% saying you won’t get to a second date. Ouch. If you have a flip phone or a cracked screen, you’re at the bottom of the digital dating totem pole, so head to the store and upgrade and fix that screen now. 86% of women are more likely to negatively judge a man for having a cracked screen. And if you’re texting with that clicking noise, STOP now. The survey said boomers hate the audible key clicks, so head to your settings and stop the noise to get more dates. #ICYMI, Here’s the transcript of the radio interview with Charles Feldman and Chris Sedens on CBS/KNX Radio. Charles: There’s a study that finds that single people who have an iPhone don’t want to date someone who has an Android phone. Apparently that’s not all. With us now to discuss this is author and expert on cyber-dating, Julie Spira, Julie, what else do we know about iPhone users and the people they don’t want to date? Julie: Well it’s interesting to know that there’s research that shows that the stigma shows that iPhone users maybe made more money than Android users. Charles: Maybe they’re poorer than Android users because iPhones cost so much. Julie: Especially when we upgrade every two years! I think this is all really interesting because it shows that daters have become picker about subjects such as technology and politics. Certainly pickier than even what your date is wearing. Charles: So seriously, you have these two people let’s say and they meet at Starbucks or something, because that’s where they meet, and one takes out an iPhone to text and the other takes out an Android phone and they look at each other and go, nope, not for me. Julie: People are doing that. Probably millennials are doing it more than boomers are, but they shouldn’t be taking their phone out on a date anyway. That phone belongs in your purse or your pocket. Charles: You know I’m taking it a step further than I probably should, but I believe I read somewhere that President Trump carries an Android. I use an iPhone. Now, not that he’s on the market, or whether I am or not, but you say it comes down sometimes to people with iPhones make more money, I’m guessing the President makes more money than I do. Chris: Are you saying you wouldn’t date President Trump? Charles: I’m just saying he uses an Android; he’s a billionaire. Charles: I think that kind of blows that one out of the water Julie. I can’t help but think, if you’re an attractive person and you see somebody, there’s a lot of people listening this who think this is hooey. Julie: Right. It should be ridiculous. You shouldn’t say I can’t go on a second date with you, because we don’t share the same interests in technology or phones. I think another point that’s so big on this study which came from Match.com, nearly 15% of adults that are currently dating, they won’t date somebody with a cracked smart phone screen. So if you’ve got an old phone, you might not get a second date. Charles: So let’s say we get past the phone stuff and maybe they both have iphones, and so they go on the date and they are happy and they go back to one place or the other and then they discover that one has a MacBook and the other has a dell. So is the relationship then off? Julie: No the relationship is not off. We really can’t be that superficial about the kind of technology our partners have. I think the more inclusive we can be about everything we can be in life, including technology, the happier we can be. So don’t sweat the small stuff. If you have chemistry and a lot in common and similar values, let someone have a different type of phone and be happy about it. Charles: Julie, Thank you. Julie Spira, she is an author and expert on cyber-dating. “You’re Beautiful you’re the woman of my dreams. Oh you’re using an Android. NEXT. Follow @JulieSpira on Twitter, Instagram, and Facebook for online dating and mobile dating advice.